Our Fall Education Conference is just around the corner. We have an exciting new venue, full day of classes and extra time to mingle with Alaska ALA members. Please review and return the registration form below so we can arrange your exhibit space at the event. Time: 7:30 a.m. to 6:30 p.m. The Business Partner committee would like to invite you all to the Wine & Cheese Social event. We had this event back in 2013 and it was a big hit. We hope to see you all there! Time: 4:00 to 6:00 p.m.
Special guest, Jonathan Galin. He is an industry professional, licensed beverage product consultant with K&L Distributors. He will be on-hand to guide everyone through a very informal and fun wine tasting/cheese pairing! Jonathan has over 30 years in the industry and currently is the only individual in Alaska to hold a Certified Wine Educator Accreditation through the Society of Wine Educators, and is a qualified product trainer for distilled spirits. Come join the fun! Business of Law Conferences-Registration is open ALA’s Business of Law Conference series. This year’s theme is “Evolving the Business of Law” and that’s exactly what the BLC’s were designed to do: offer the same leading-edge curriculum across three locations in the US. Specialty Conferences – Additionally, registration is open to attend the Managing Partner/Executive Director Forum, Law Firm Management Essentials, formerly known as Essential Competencies for Legal Administrators (ECLA), Intellectual Property Management for Legal Professionals and the Corporate Law Department Symposium, hosted by the Boeing Law Department. Register today at http://www.alanet.org/events/ and be a part of these high caliber educational events! Happy 35th Anniversary Alaska ALA! 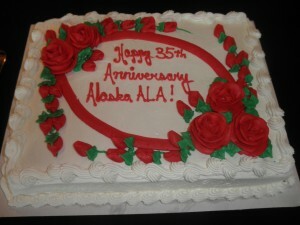 Alaska ALA celebrated its 35th anniversary in February. Our 2014 Chapter Survey of Salaries and Benefits is now available for purchase. Firms who participated in the survey – $100. Firms who did not participate – $275.